STEPHAN H. ANDRANIAN is a partner with the law firm of Vogt | Resnick | Sherak. Mr. Andranian has over 16 years experience in civil litigation, representing clients in business, contract, public and private works construction, landlord-tenant, and personal injury cases. Mr. Andranian has served as a political advisor and lobbyist and has testified before Congress and numerous state panels on public land use issues. Mr. Andranian is a member of the California State Bar and is also licensed to practice before the United States District Court. 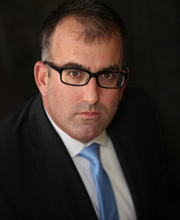 He is the Chairman of the LEInternational (Law Europe International) Real Estate Practice Group and a former Planning Commissioner for the City of Costa Mesa, serving as the commission’s Chairman from 2017-2019. Mr. Andranian received his Juris Doctor degree from the John Marshall Law School in Chicago and his undergraduate degree from the University of California, Davis.